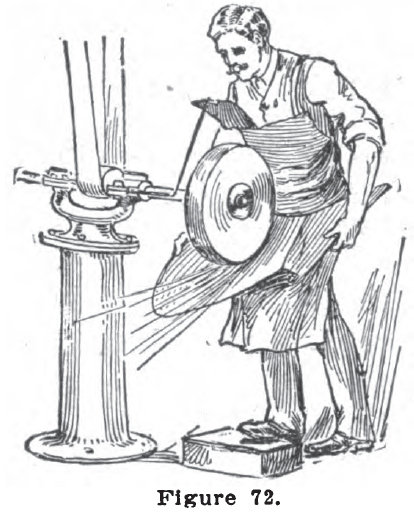 Our trade journals are full of advice in regard to tongs and devices with which to hold plowshares so that they shall not spring in the hardening or during the process of sharpening. Let me state right here that all these devices are failures. Even in a factory where all shares are of the same shape, have their tongs and devices proved useless, for, as soon as the share is let out of the tong, it is found that they are crooked just the same. There is one thing, and that is the only thing that will prevent warping in hardening a share; namely, the proper heat. By the proper heat is meant, first, a heat that is even, not heated with a spot too hot and another too cold, but even; second, a heat not too high, for it matters little what vise your share is held in, if it is too hot, it must warp, and, if the heat is not even, the same result will follow. In heating a share for hardening, you will observe that it will, in most cases, spring out of shape. A good many blacksmiths think that the warping is all in the cooling off or hardening process, but this is not so. When the share is hot, sprinkle with prussiate of potash. Next set the share right, for you will notice that in heating it has sprung up along the edge in the center, and in cooling it will also spring or warp upward. The share should therefore be set down along the edge so much that it is about three-sixteenths of an inch too low in the middle. This done, and it must be done quickly, draw the share over the fire with the edge down, so that it will get back the heat lost in shaping, for the thin edge will cool off faster than the lay. Now plunge into a barrel of salt water. Do not use liquid hardening compound, for this will case harden both sides of the steel, which is not necessary, and makes the share brittle. Neither should you set the share for hardening to a leveling block, for this block, being cold cast iron, will cool off the share along the edge, and for that matter, as mentioned before, the share must stand below the square in the center, in order to come out all right in the hardening; so a leveling block is of no value for this work. You must have the share in your eye, and set it on the anvil, before you can expect to become a proficient plow maker. The plowshares should have a dip; that is, be set down on the point from one-eighth to one-fourth of an inch. If a plow doesn’t run with this dip, there is something wrong somewhere else. In gang plows, we often see a dip of three-fourths of an inch, and the result is that they run heavy and break often in striking stones and rocks. If a walking plow is inclined to tip or lean over to the right, roll the share up along the edge, especially on the heel. If it tips to the left, turn the edge down. If a plow runs unsteady, going up one minute, the next going too deep, the fault might be that the share is too dull, or it may not be bolted so that it is held rigid to the plow, or it may be too little dip, or the upright or beam may be loose. Look the plow over, and, if you see nothing else wrong, sharpen and give a little more dip on the point, and it will run steady. In sharpening a plowshare, do not hammer on the bottom side, for you will then hammer the shape out of the share, and the scales on the anvil will roughen the surface just as bad as the hammer. Have a smooth hammer and strike on the face of the plow. When one gets used to this, there will be very little hammer marks, and you can keep the shape in the share. In pointing a plowshare, do no think of all the smart instructions you may have seen in trade journals about using mower sections for points, for to do that is just so much time wasted. For points, use good steel 5/16 or at least not thinner than 1/4 inch steel, and cut as shown in Fig. 61. Draw out the ends; then bend at dotted lines, the short end to be on top of the share, and the long end to go on the landside. This will make a good, solid point that will wear well, and stand the butting against stones and rocks. 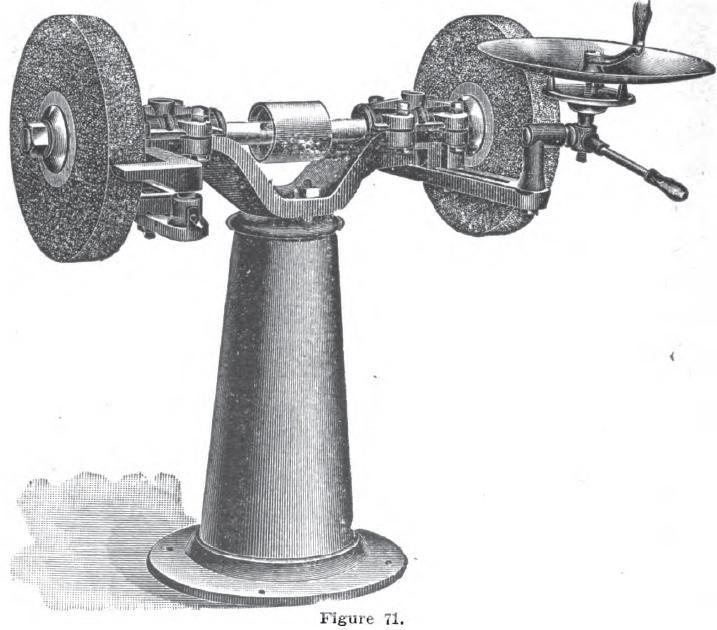 In grinding plowshares, the grinding should be done on a solid grinding wheel before the share is hardened, for if it is done after the share is case hardened, the case hardening will be ground off, and the share cannot scour. The share should be ground and polished before it is hardened; then after it is hardened, it should be lightly polished on a buffing wheel, such as is shown in Fig. 70. This is a wheel with a flexible face, such as is required in plow work. For full information about Eureka grinders and rapid cutting emery wheels, write to Chicago Wheel & Mfg. Co., 39 Randolph St., Chicago, Ill. If the Eureka grinders and the emery wheels manufactured by this concern are used, the danger connected with the running of emery wheels is reduced to a minimum, and time is saved by the quick cutting qualities of their wheels. Fig. 71 shows a Eureka grinder. Fig. 72 shows their emery wheels.